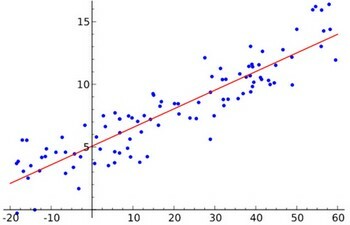 “Linear regression” is a standard mathematical technique for predicting numeric outcome. This is a classical statistical method dating back more than 2 centuries (from 1805). The linear model is an important example of a parametric model. Linear regression is very extensible and can be used to capture non-linear effects. This is very simple model which means it can be interpreted. There's, typically, a small number of coefficients. If we have a small number of features that are important,, it predicts future data quite well in a lot of cases, despite it's simplicity. You have a cloud of data points in (2|n) dimensions and are looking for the best straight (line|hyperline) fit. You might have more than 2 dimensions. It's a standard matrix problem. is linear. Even if true regression functions are never linear. It produces a model that is a linear function (i.e., a weighted sum) of the input attributes. There are non-linear methods that build trees of linear models. In two dimensions, it's a line, in three a plane, in N, a hyperplane. the B values are weight (known also as regression coefficient or parameters). the X values are the value of the predictors variable. Linear Regression works naturally with numeric classes (not with nominal ones) because the predictors are multiplied by weights but can be used for classification as well. Calculate weights (B) from training data. Large correlation is good, and the value cannot be greater than 1. Calculate an error (The squared error) on the training data and try to minimize it by choosing the best weights. and then apply a threshold to decide whether it's 0 or 1 (two-valued nominal classes). Prediction Accuracy: especially when p > n, to control the variance. M5P performs quite a lot better than Linear Regression. Weka has a supervised attribute filter (not the “unsupervised” one) called NominalToBinary that converts a nominal attribute into the same set of binary attributes used by LinearRegression and M5P. To show the original instance numbers alongside the predictions, use the AddID unsupervised attribute filter, and the “Output additional attributes” option from the Classifier panel “More options …” menu. Be sure to use the attribute *index* (e.g., 1) rather than the attribute *name* (e.g., ID).